The repair of the Newport Lock Gates using Rotafix Structural Adhesive (RSA) offers a challenging environment for any adhesive to withstand the saline conditions and movement of the tide. Following a number of incidents involving collisions with vessels the integrity of the seal on the lock gates in Newport Docks was compromised. Following an in situ inspection of the gates by Rotafix it was deemed necessary to remove them to allow offsite repairs to be completed. The gates were removed then floated from Newport to Appledore Shipyard, North Devon, for repair. Rotafix were asked to support the refurbishment programme by supplying technical advice and repair methodologies that would withstand the environment and provide a repair that would stand the test of time. 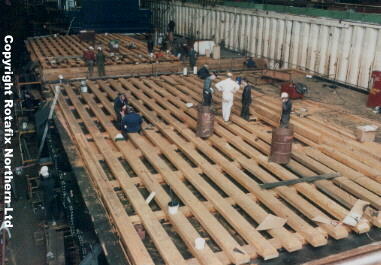 Our philosophy, to replace timber with timber where possible, resulted in skilled carpenters removing the damaged sections of wood from the lock gates, so creating voids shaped to receive the replacement green oak sections. 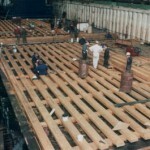 The new green oak sections were bonded into place using Rotafix Structural Adhesive (RSA). RSA is a two part low modulus epoxy that flexes and expands at a rate similar to that of green oak. It was not affected by the salt water or the cyclic wetting and drying that occurred during the ebbing and flowing tides. 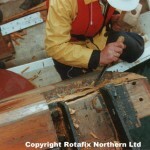 Where it was necessary to replace faces and complete sections of timber Rotaflex Glass Fibre Rods (GFRP) were used as dowels to connect parts. The rods were bonded in place using RSA. The slow setting nature of RSA allowed adjoining parts to be placed, moved and finally adjusted to fit over a period of 8 hours – when left overnight the adhesive cures to give a lasting bond. 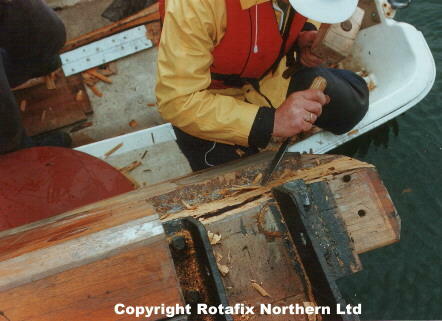 For further information about the Resiwood system of repair, using RSA, or obtaining species matched replacement timber for use in a marine environment to meet your requirements, please contact us on +44 (0)1639 730481 where one of our technical team will be happy to assist.